Create your own recipe book! 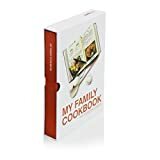 The perfect recipe book ready for your family’s favourite dishes and secret recipes. You can archive generations of kitchen secrets and keep your favourite recipes in the family. Home-cooked is always better. Mum’s amazing Sunday roasts or Nan’s awesome chocolate cake. Every family has special recipes that give us that instant feeling of nostalgia. Create your own recipe book: Write down the required ingredients and method, personalise with photos and share your secret recipes with the rest of the family. This is a perfect unique Christmas gift for mum or a great kitchen gift. Template pages with space for over 80 recipes. An introduction with useful cooking guides, tips, tables and more. Measures: (h)22cm x (w)16cm x (d)3cm. Weight: 0.64kg.